This beautiful red liturgical stole is handcrafted by our expert vestment artist Lynne Green. We are continually adding to our collection here at the Everything Vestment Store, so check back often or better still, sign up for our free ezine. We'll keep you apprised of any new inventory that comes in. This rich red stole is made from a beautiful red vestment fabric and lined with red satin. Full length is 95 inches from end to end. The ends of the stole have 3-inch gold fringe. There is also a one-inch accented gold embroidered cross located at the center of the stole. Both ends of the stole are decorated with a gold embroidered cross. Are you looking for a custom made deacon's stole? 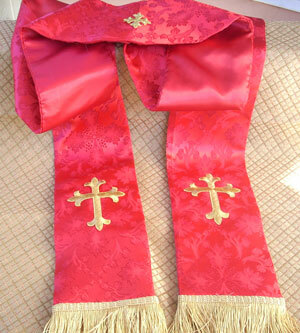 Our custom made stoles come in your choice of color and embroidered cross. Learn more and purchase by clicking here. Our custom made chasubles also come in your choice of color. You can learn more and purchase a custom made chasuble by clicking here. Are you looking for a complete custom made vestment set? You can learn more and purchase by clicking here. Save even more money when you make your stoles, chasubles or vestment sets yourself. You can find patterns here. Or purchase a deacon's stole, Gothic stole, or Vestment set kit by clicking here. Not sure how to make a stole? You can learn how by clicking here. Learn how to make a chasuble by clicking here. Did you know that the word stole comes from the Latin word stola and was originally a napkin used by servants to wipe down vessels? You can learn the history of the stole by clicking here.